Community service isn't a punishment. Community service is the right thing to do. First and foremost, these opportunities are intended to show your son or daughter that they have always been enough to contribute in a positive direction for our communities. An added perk to participating; it offers an alternative to detention pre-adjudication. YouthZone’s Friday and Saturday Service Programs offer our clients the chance to connect, on a deeper level, with the beautiful people that make up the communities of the Western Slope. We work alongside affiliated community nonprofits, which provide a structured investment in your teen's day. Additionally, community service is always done in the group setting which encourages teamwork and companionship. Since your teen's safety is not only your concern, but ours as well, you can rest assured knowing that a qualified YouthZone chaperone is always in attendance. 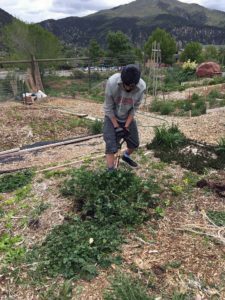 These group projects take place every First and Third Saturday every month in Glenwood Springs. Every second Friday of month, they're located in Rifle.